Trump keeps claiming the trade deficit is going down. It’s not. The president really, really, really wants trade deficits to decline. But reality keeps biting. Well, that’s because it was not true. He stopped making that claim after our fact check appeared. But this is also not correct. Regular readers know that we frequently say that Trump’s obsession with trade deficits is misplaced. A trade deficit simply means that people in one country are buying more goods from another country than people in the second country are buying from the first country. Americans want to buy these products from overseas, either because of quality or price. 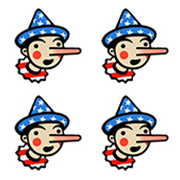 Nevertheless, the president keeps citing trade deficit figures, so we will have to keep fact-checking him. The day before the president spoke in Hanoi, the Commerce Department released an advance report of the December trade deficit. It showed the deficit for trade in merchandise — the figure Trump often refers to — was $79.5 billion in December, up $9 billion from $70.5 billion in November. Indeed, the earlier report shows that the goods deficit decreased $6.7 billion, to $71.6 billion. But, as we have just shown, the deficit went up the next month — to what turns out to be a record high (before inflation) for the goods deficit. Actually, a better measure would be to compare November 2018 to November 2017. That shows the trade deficit increased year over year. Moreover, despite that drop in November, the trade deficit for all of 2018 is expected to be one of the highest on record. The Bureau of Economic Analysis’s report on the fourth-quarter gross domestic product, released hours after the president spoke to reporters in Hanoi, indicates that the gap between goods and services exports and imports widened to more than $625 billion, compared with $566 billion in 2017. That would be the highest trade-deficit number in 10 years. The GDP report also indicates that the goods deficits will widen to more than $900 billion, compared with $810 billion in 2017. This presumably will be a crushing blow to a president who spent the past year falsely claiming the United States “lost” $800 billion on trade. As for Trump’s claim that the deficit came down because of “tariff money,” that’s poppycock. We’d previously estimated that the Trump tariffs brought in about $3 billion in November (and a roughly equivalent amount in December). But that pales in comparison to monthly deficits of $70 billion to $80 billion. Moreover, the tariffs would affect the deficit only by decreasing imports, not by reducing the trade-deficit figure. But there’s been no decline in imports. Using three-month moving averages to smooth out the data, we see imports generally kept moving up, until a slight drop from October to November. Comparing individual months in 2018 to 2017, imports were higher every month in 2018. The president keeps seizing on scraps of data — a month here or a quarter there — to falsely claim the trade deficit is being reduced. But over the course of the year, it kept growing. Attributing a small one-month shift to tariffs is especially silly. It would be better for the president to end his focus on the trade deficit, because whether it grows or shrinks is largely beyond his control. But in the meantime, he earns Four Pinocchios.